So, we’re all wondering whether the head coaching change will lead the Pack back to the promised land. Though many theories can be explored, I’d start with how the arrival of Matt LaFleur should vault Aaron Jones into his proper place as one of the league’s star running backs. At least we no longer have to scratch my head over Big Mike’s bizarre handling of Jones. 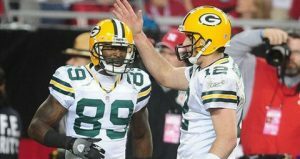 It no longer matters why McCarthy failed to exploit Aaron’s talents. I hope, however, that it played a major role in CEO Murphy’s decision to dismiss him. That would be just desserts for his mishandling of such a game-changer. Jones is a great feel-good NFL story, and he was one of the biggest steals of the 2017 draft – credit to the draft team who I believe at that point had effectively taken over the duties of GM Ted Thompson. Just in case there are those who still don’t think Jones is special, I’ll recap. The fifth-rounder out of UTEP (19th RB overall) was virtually the only talented player in El Paso during his four years with the Miners. Every defense UTEP faced had but one focus: stopping the small but well-built running back and his lightning-quick changes-of-direction. Very few opponents held Jones down. Just to sum up, in four years at UTEP, and despite some injuries, Jones rushed for 4,114 yards and averaged 6.3 yards per carry. Counting his 71 receptions, he accounted for 40 of the team’s touchdowns. Jones still frequents El Paso in the off-season, where he remains revered by the locals. From 2013 through 2016, Jones was UTEP football. Though the team had 18 wins and 31 losses in that time, they probably don’t win a half-dozen games without Aaron. Minus Jones, the Miners went winless in 2017. Here’s what the scouts said as he was about to be drafted into the NFL: “good vision”, “lateral burst gets him outside the tackles quickly”, “always seems to find the best opening”, “makes tacklers miss in the open field”, “never giving up on the play and consistently getting hidden yardage”, “home run ability”. Doesn’t that pretty well also describe his NFL performance to date? How was Aaron used during college? As often as possible. On 10/29/17 I did a posting titled “Nothing Has Ever Stopped Aaron Jones – Except Injuries.” That article documents what the Packers were getting. Jones was made UTEP’s workhorse, and the more touches he got the better he played. By the time he finished up in 2016, he possessed the school’s single season records for rushing yards (1,773), carries (229), and rushing average (a gaudy 7.7). He averaged 19.2 carries per game, and he got better every year. He capped his career against North Texas with 301 yards on 24 attempts, four rushing touchdowns, and 312 all-purpose yards. That’s efficiency: 12.5 yards per carry. Now that he’s been a pro for two years, it’s time to update that header: “Nothing Has Ever Stopped Aaron Jones – Except Injuries and Mike McCarthy”. We’ve all seen how Big Mike utilized Aaron, despite him being an immediate dynamic presence in the NFL. In the second game that Jones saw action – a 35-31 win at Dallas – Aaron outplayed Ezekiel Elliott, with 19 carries for 125 yards, a 6.9 average. He’s never since had that many carries; in fact he’s only exceeded 15 carries four times in two years. In his final six games under Big Mike in 2017, he was handed the ball a total of 19 times. Though he as usual averaged well over five yards a carry, he was a non-factor as playoff hopes slipped away. The exception was when he got his sole carry in overtime against the Bucs, and ran it in from 20 yards out to account for the win. 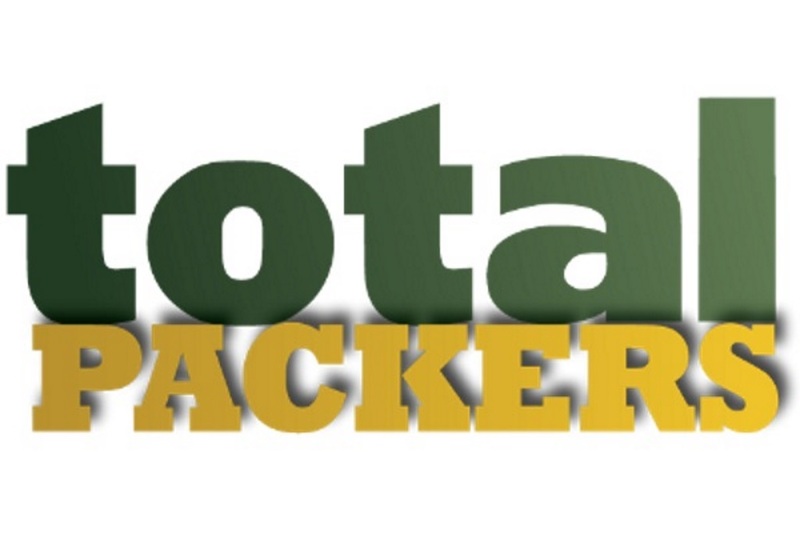 The Pack dropped their final two games of the year, missing the playoffs – Jones had three carries in each loss, Unfortunately, Jones was injured early in that season finale against the Bears – and there went the season. Even then, he turned those six chances into 60 yards. 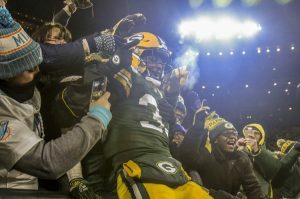 In 2018, the Packers went 2-1 in the three games Jones had 15 or more carries. In the nine games he had fewer carries, Green Bay went 2-7. This all begs the question: how many wins did the under-usage of Jones cost the team in 2017, and then again in 2018? My sense is that it probably cost us two wins each year. If so, this factor all by itself kept the team out of the playoffs each time. My biggest gripe about how Jones was utilized by McCarthy is simply that he was rarely given a carry designed to go outside the tackles – this is where his lateral quickness, vision, and shiftiness comes into full play. I’m hoping LaFleur will give Jones from 15 to 20 carries per game, with at least five being sweeps or otherwise meant to veer outside the tackles. This would spread the field sideways and discourage defenses from “stacking the box”. 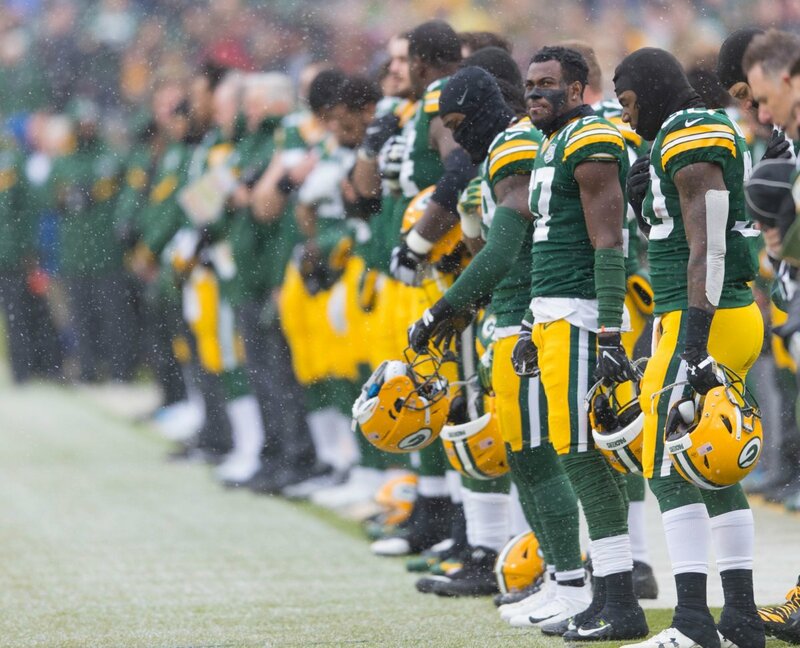 Will the Pack Adopt Current Offensive Trends? Jones (5’10”, 206 to 215#?) needs to take his rightful place alongside several other smallish, shifty running backs who have turned the league around with their productiveness: Philip Lindsay (Broncs), 5’8”, 190#; Kerryon Johnson (Lions), 5’11”, 206#; Matt Breida,(49ers), 5’10”, 190#; Christian McCaffrey (Panthers), 5’11, 205#; Alvin Kamara (Saints) 5’10”, 215; and Kareem Hunt (Chiefs, formerly) 5’10” 216#. It’s these guys who gave NFL defenses fits in 2018. Here’s their yards per carry averages for the regular season: Aaron Jones, 5.5, 1st in NFL; Lindsay, 5.4, 2nd; Johnson 5.4, 3rd; Breida, 5.3, 4th; McCaffrey, 5.0, 9th; Kamara, 4.6; and Hunt, 4.6. Jones also averaged 5.5 yards in 2017, though his 81 carries didn’t even qualify him among the league leaders. How will the arrival of Matt LaFleur impact Jones? As Tennessee’s play caller, LaFleur had a bruising RB in 247-pound Derrick Henry. In Tennessee’s first four games, Henry got the ball 16, 21, 33, and 17 times. Though shrimpy, Dion Lewis started getting his share of snaps, Henry finished the year with 215 carries for 1,059 yards – and I nice 4.9 yard average. Unless injuries interfere, the Packers should have their first 1,000 yard ground gainer since Eddie Lacy went for 1,139 yards in 2014. And that should translate into the Pack returning to the postseason. I agree 100% with your assessment of Jones, as well as your assessment of Buffoon’s sinfully poor use/misuse of Jones. Certainly with all of the press stating A. Rodgers was opting out of many of Buffoon’s play calls, one has to wonder if Rodgers was merely taking a dive to RT (which usually went nowhere) away from Jones, or perhaps a sweep which may have produced? None of us will ever know, but it is food for thought. In many ways I am almost certain that Rodgers was most likely attempting to just keep the Packers offense on the field by mitigating Buffoon’s pedestrian play calling. Let us trust that the new offensive system works, and thus engages Rodgers rather than compels him to opt out of nearly every friggin’ play called . . . I have taken a sip of the LaFleur koolaid and that is about it. I am still firmly convinced that this coaching search was bungled. But in the meantime, I will entertain myself with hypotheticals and possible projections of what the offense could/should be. In a magical fairytale world far far away, LaFleur will transform the packers offense into having everything start with the running back position. The running game will be transformed into two headed monster much like the saints and the titans had. Running backs will enjoy plays and schemes designed to their strengths. Ugh. I tried. But then I remembered Dion Lewis was in Tennessee last year and another coach the packers interviewed had Lewis in his offense previously he had flourished. Well, look at the bright side. If they can’t fix their O-line problems this off season, Jones can be the man after Rodgers gets killed. Right up until Jones gets injured. Where’s Eddie Lacy when you need him? China food, baby! Jones if he can stay on the field does make his share of big plays. Injuries have been an issue. But Jones also needs to do his part as an employee and teammate. One point not addressed in this article is the two game suspension Jones received for either a DWI, or because Jones was in the NFL’s substance program, and was not in compliance. No one but Jones took himself off the field for 2 games this season. You can’t help your team if you are suspended from the team and game. If the suspension by the NFL was solely for the DWI, then Jones is now currently in the NFL’s substance program. Jones may have been in the substance program prior to the DWI? Remember Jones also had a DWI while in college in an off season incident. Maybe Jones has had a learning experience, but you would think the college incident would have been that learning experience. There is usually a reason why some players are not drafted higher than they are and it is not always a physical limitation. Jones also needs to take care of his own personnel business if he wants to be on the field and help his teammates every game. Nice to have these types of articles back on TP. Thanks Rob. Good write up on the use/misuse of Aaron Jones. Now I don’t want to come off as being too stoooopid for suggesting we should feature a running back a little bit more. You know? Well, if it works, if it wins, and if it opens up a better and more diverse passing attack. You bet he should. Because one yard behind the line wide receiver screens barely ever went anywhere except into the stat book as a completion. Yeah I saw that comment and decided to let poindexter be. He can live in his delusion. The packers were somewhere in the top 3 for percentage of plays that were passes. It’s not exactly a winning formula, especially against quality teams with good pass rushers. The packers will be so much better off if they can engineer a running game to keep defenses honest as well as mix in jet sweeps and motions across the formation on play action that help tip off what coverage the defense is playing. Anyone who has watched the Rams or Titans quickly sees one thing. These teams have many, many more run attempts than the Packers and they have a much more varied run game. And they use play action to open up the pass. People talk about how modern McVay’s offense is, but basically what’s happened is that defenses, like the Packers defense under Capers, had become mostly nickel and dime defenses and these modern running games are taking advantage of this. McCarthy only used the running game to keep defenses honest and in the last few years he didn’t even do that. All this being said, there are a lot of questions. Will Rodgers buy into this? For many years it appeared that Rodgers and McCarthy both loved to spread it out in the passing game. Rodgers is one of the few quarterbacks whose stats actually drop when he runs the play action. Do the Packers have an offensive line to pull this off? Their offensive line is great at protecting their QB but isn’t very good at mowing guys over. 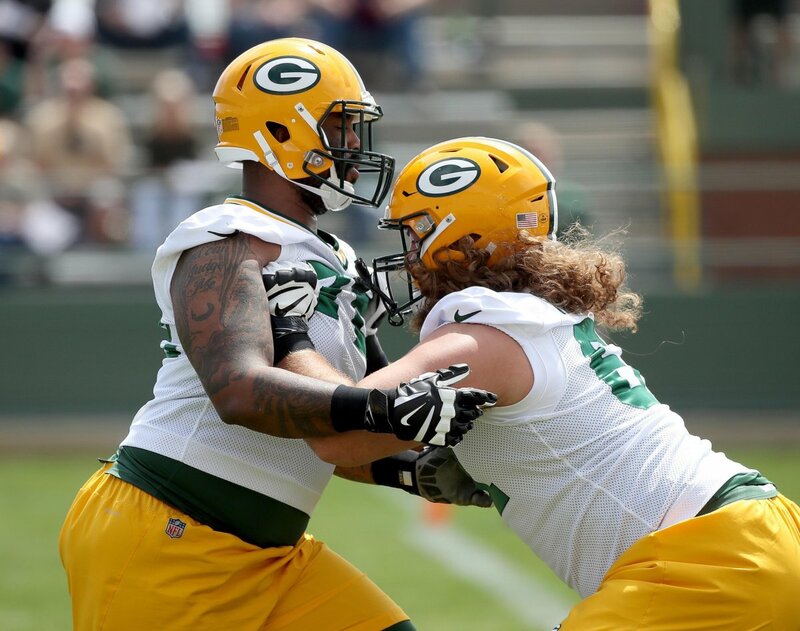 Of course, the Packers will likely load up on guards in the off season. 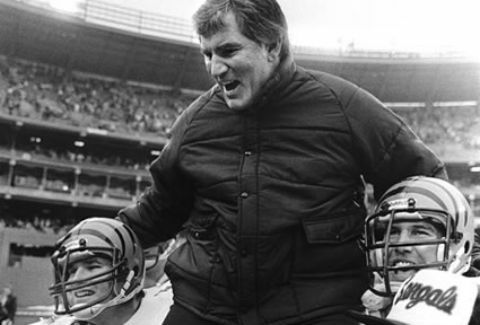 Unlike the true West Coast offense which has won many Super Bowls, this style of offense (although technically the coaches all use West Coast nomenclature) has yet to win anything. Great at protecting the QB? Whatever PFF says i guess. Like when they said T Willy was ranked 9th last season. This season, 68th. I might keep this site on my bookmarks still. Anyways, great argument for how Jones did appear to be misused. I can’t help but think that if prodded, McCarthy’s argument would be that due to Jones’s being injury prone, he was saving his back for the end of season stretch and, consequently, playoffs.